It is a widespread belief, amongst many today, that life, social or otherwise in inter-war Mumbles, was in a state of regression or, at its best, wallowing in stagnation. So little has been preserved of the social life in that period that it is easy to believe that nothing whatsoever went on, that the Dark Ages had returned and that there was no advancement in learning, research, social welfare or anything at all! Time stood still. The wheel had been discovered and that was enough. Mumbles was an intellectual vacuum. Although the majority of the population had never had the doors opened to higher education, their brains were filled with a driving intelligence that clamoured for knowledge in the arts and the sciences. This was demonstrated in no uncertain manner when, in 1936, the doors opened to the treasury housed in the new Dunns Lane Library. On opening day, crowds turned up for enrolment, all to be warmly welcomed by senior librarian, Victor Morgan. Regardless of social status, whether child or pensioner, Mr. Morgan and his colleagues would strive to supply that right book and offer guidance. The Library became a Mecca, especially for the senior members of the community who all their lives, had been deprived of such a facility. How they loved those loaded shelves and the host of daily newspapers available in the Reading Room! Side by side with this craving for academic enlightenment, there existed another urge, especially amongst the younger set and that was, of course, for physical challenge. Like today, the average young person was capable of sitting with a book, for a limited period and then would come restlessness, which could only be assuaged by getting up to do something! With hyperactive brains and restless limbs, energies were diverted to outdoor activity and/or to making something. So, despite the gloom of the prevalent social conditions, Mumbles buzzed with a vitality and was a good place in which to live, certainly possessing something which is absent in today’s profligate society. Shortage of money, invariably, ruled out the purchase of most, desired manufactured goods, leaving the simple options of, either going without, or endeavouring to make it with one’s own hands. Such was the calibre of Mumbles people during these lean times, that this latter option was the one usually chosen and brawn and brain power was utilised, to create that desired object. In other words, deprivation was the genesis of this mental and physical activity. In the mid thirties, Freddie Grace and his stalwart band of friends; “Tiddy Talbot, Vincent (Vinegar) Trailor, John Kent and Lawrie Williams found themselves in this precise situation! They desperately wanted to own a five seater canoe! How it all started, no one seems to know, but almost certainly, that fine 1930s film shown in the Tivoli, “Sanders of the River”, was an influence. The magnificent Paul Robeson starred as the African Chief, being conveyed everywhere by a massive canoe, heavily draped in leopard skins. The speed and grace with which this vessel skimmed along the Zambesi, was awesome. The germ of an idea was planted! The combined income of these four lads barely reached £3.0.0. per week. Not one of them had an iota of boat building experience and they were unable to find a solitary person to advise. Let’s face it! Just how many five seater canoes have ever been constructed in Mumbles, or anywhere for that matter? and Isambard Brunels they were not! To say the least, this was a formidable challenge but the gauntlet was taken up and defiantly accepted! After all, they were Mumbles boys, reared on laverbread and Johnny’s chips. They saved. They scraped. They scrounged. Eventually they assembled enough material to construct: “Hawk”. It should have been named “Titanic”. They laboured for months in Fred’s back garden until Hawk was completed. Then, with test pilot, Donald McGuffog, as the sole occupant, the finished craft was launched off Southend, with as much pride (and anxiety) as that associated with the launching of Brunel’s “SS Great Britain”. There was good reason for this concern- Hawk measured twenty feet in length! Sadly, “Hawk” suffered an ignominious fate, of Capello / England proportion: It sank within minutes. In funereal silence, they walked home, so disconsolate, that they completely forgot about the wretched test pilot, Donald, who had “gone down magnificently with his ship” and was somewhere immersed in the turgid waters off the groynes in Southend. This fine vessel was launched six months later and this time, for some reason or another, Donald, declined the invitation to conduct its sea trials. Possibly, a fit of pique. This time, Hawk 2 had a rudder and an attempt was made, by Tiddy, to power the vessel with an engine. Ingeniously, he coupled a propeller and shaft to an old gramophone engine. Out of the water, the small propeller rotated at great speed, but when clipped on to the back of the canoe, and immersed in the sea, was found to be only capable of two revolutions per minute! Disappointment, but knowledge of hydrodynamics was gained. These five lads had ventured into unknown territory and created something tangible, entirely by their own efforts. It provided them, and others, with an enormous amount of harmless fun and pleasure. In spite of the heartbreak of failure at the first attempt, they came back, tried again, and succeeded. What is more, one day they raced the Mumbles Rowing Club Eight, across the Bay- and won! In similar vein, but pre-dating the above event by at least a decade, three Mumbles youths embarked upon a far more technical venture. Fred Williams of Gloucester Place (old Mumbles stock, his father actually worked on The Cutting to Bracelet Bay), Jim Kostromin of Westbourne Place (ethnically of Finnish origin and whose invading forebears had settled in Mumbles, centuries before) and Emrys Owen of Llanelly who was Fred’s brother-in-law. He worked on his family fish stall in Llanelly Market but spent an enormous amount of his leisure time in Mumbles. I remember him as a delightful chap with a magnificent tenor voice (but then, weren’t all Llanelly men, gifted with fine tenor voices?). News travelled relatively slowly in those days. Cinema newsreels presented films which were, at the best, a couple of weeks out of date and newspapers, understandably, came with news a day old. Wireless was in its infancy and early enthusiasts received news of the outside world, faintly and unpredictably, on the “Crystal Set”. These barely audible signals were picked up, via the “cat’s whisker” gently tickling a crystal and listened to, through earphones. Reception was so faint and so unreliable, but at least conveyed up to date world news! Then came revolutionary change! There had been a breakthrough! 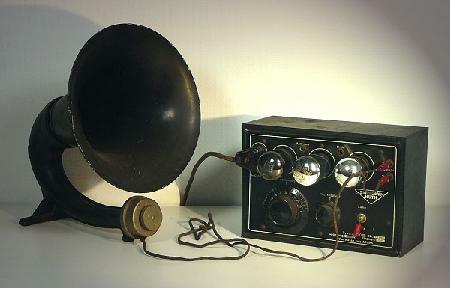 The valve radio receiver set had been invented and studio transmitters, similarly augmented and, as a result, powerful signals were being received, and listened to, through loudspeakers instead of earphones. But! There was one monumental drawback- the price! Such a valve set was priced in excess of £25.0.0.! A king’s ransom! Even in those early days, Jim Kostromin had been bitten by the wireless bug and one evening, when Fred Williams was grumbling about the poor reception of the family crystal set, Jim talked about the new and amazing breakthrough in radio. His listeners were fascinated but interest instantly waned when the cost was revealed. This was such an audacious suggestion that Fred and Emrys thought Jim was clowning. They needed convincing. Jim researched the project, costed it and at a later meeting sold the idea to his doubting comrades, the three budding Marconis decided to go for it! I suspect that the guiding force was not just the thirst for up to date news, or entertainment, but a challenge for their ingenuity. Again, that desire to create something tangible with a worthwhile end product. Make no mistake about it, these three lads possessed all the essentials necessary, to tackle such a venture as this. Fred had attended Dynevor Secondary School and had a basic knowledge of science. Jim had been a wireless “buff”, since his earliest days and Emrys was the “handyman” who could solder “a shilling to a bar of soap” but, perhaps, outweighing all these qualities, was their innate intelligence and Mumbles tenacity (with a dash of Llanelly’s). Jim had written to “Amateur Wireless” seeking advice and options. 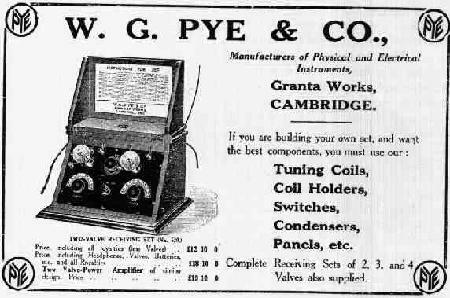 The magazine had responded, supplying an appropriate circuit and instructions for the making of a multi-valve wireless set. They decided to work in Fred’s house on a sheet of plywood which could be carried to and from the garden shed, with the embryonic wireless set upon it. From their savings they bought a chassis and, week by painful week, they purchased parts. Slowly and carefully they assembled these delicate organs. Emrys demonstrated his soldering skills, again and again. They learned a new language, one of diodes and triodes, of condensers, rheostats, earths and aerials. Fred interpreted the strange technical jargon. Jim assembled. Emrys went on soldering. They totally disregarded the jibes of those about them who, in their ignorance, could not imagine how such a tangle of wires, glass bulb things and dials could possibly receive the most basic of signals. The intrepid three continued. It slowly began to take shape. The months went by and the whole ensemble on its metal chassis began to take on a compact, and neat appearance. The last fragile valve was purchased and fitted. Fred with his fretwork set, neatly and accurately, cut a rectangle of plywood with drilled holes to accommodate the control axles from the condensers and rheostats. He proudly fitted this to the front of the nearly completed set. Now the control knobs and dials were fitted over these projecting axles. Although the rest of the set was still exposed, it really began to look like a highly technical piece of scientific and sophisticated apparatus. This was all really well, But! Would it work? After eighteen months of hard work, religiously adhering to the Amateur Wireless’ instructions, the wireless set was completed! Two power sources were needed. A low voltage DC supply, from a hefty dry battery and a high voltage DC supply, from a rechargeable accumulator (or “wet battery”). These were acquired by Jim. By this time, the three pioneers were financially spent out and the purchase of a loudspeaker was beyond contemplation. So, it had to be earphones! This, of course, created a problem as to who would be the first to don these phones, tune in and have the privilege of probably being the first Mumbles person ever to receive a radio signal on a valve set? They decided to toss for it. Jim won and generously, the other two conceded that, after all, he deserved the privilege. On that historic Friday evening, Jim Kostromin arrived at Fred Williams’ house, where an excited Emrys Owen was waiting. He struggled in with the heavy accumulator and the bulky dry battery. These he placed on the floor and table respectively. Before placing the wet battery on the floor, he laid a square of old linoleum to go beneath it. “Why the lino, Jim?”, asked Fred. The two dry battery wires were already connected to the set and ended in neat little plugs-one red and one black. Jim placed these in the appropriate holes in the dry battery. They were getting close! The two wires for the accumulator ended in “crocodile clips”. Jim attached these to the wet battery terminals- positive and negative. These wires trailed from the set on the table to the battery on the floor. Jim donned the headphones, leaned forward and placed a finger on the little “up and down” switch at the bottom of the plywood facia. He pressed down the switch. No signal of any sort was reaching his ears. A minute passed and then they all cried out! The valves in the set had begun to glow, red and mysteriously. There was a faint humming from the entrails. History had been made here in Gloucester Place, Mumbles! They all yelled with joy! But there was better to come! Suddenly, Jim tuned in to music! He heard a woman’s voice! A singer (later they discovered that it was the famous Madame Patti). Fred was beside himself with excitement. He tore around the table with the intention of being at Jim’s side. In every situation, there is always the most dreaded, possible BP-like, scenario for disaster. There was one for this situation. It was about to take place. Fred had forgotten one vital thing. There were wires going from the set to the accumulator on the floor. The plywood front lay on the floor, at an angle against the table. The chassis lie upside down with wires trailing to the accumulator which lay on its side, spilling a noxious steaming liquid that began to run across the floor into the carpet. Fragments of fine sharp glass were scattered about the area, from valves that would never, ever glow red and mysteriously again. It was a scene of utter, crunchy ruin. “I just can’t face the old man and his, ‘Ho! Ho! Ho! I told you so!’. Let’s go down the Vic and have a half”. This they did. They sat in the corner, silent and uncommunicative. Not a word, just a few mouthfuls and swallows. Suddenly, Jim’s head fell forward and his hand shot up to cup his mouth, which was full of Hancock’s best ale. Explosively he burst into laughter and sprayed the whole table, and its occupants, with beer. He tried to speak but just could not, for laughter. Fred looked at Emrys, whose shoulders started to shake and they both burst out laughing. The few locals in the bar and the landlord thought that these three young man had gone insane. In actual fact that laughter was the first sign of “coming back”! Next day, Jim examined the debris and found that apart from the valves and the accumulator, most of the apparatus could be resurrected. Within three months, they were back to square one, wiser and more controlled. “I got to take back all I said. In the end, you boys done real tidy like! So, Mumbles got its first valve wireless set, thanks to the initiative and firm resolve of three (well two and a half) Mumbles boys. All three I remember as delightful men of good humour and kindness. Jim Kostromin chose to make wireless and electrics his profession and studied hard in evening classes, to get the qualifications. He eventually opened his radio shop in Gower Place, (presently occupied by a carpet dealer). He lived above it. No Castle Field fete, or outdoor function, in Mumbles was complete without Jim’s loud speaker systems and lovely music for dancing. Wartime saw him serve his country in the RAF and rise to the rank of Squadron Leader, operating the new Radar system in the Burmese theatre of war. The story of his receiving a Japanese General’s sword in surrender, has been told. He returned home to Mumbles to change course and became a most successful restaurateur. Fred Williams lived up, and exceeded, all his father’s expectations. He left Dynevor School to work in the Local Education Department of the Guildhall, Swansea. He was called up for military service in WW2 and served in the Royal Artillery in an Ack Ack Unit, based in London. His slight deafness ruled out overseas posting but he served throughout the London Blitzes. He returned in 1946 to employment in the Guildhall. He was a regular customer at the Vic and was usually accompanied by his boss, Director of Education, Eddie Charles. He was soon to take over and become Director, himself, when Eddie moved on. Fred married his lovely Betty, but could not persuade her to leave her much loved Danygraig. However, he was to settle there, very happily, and was soon blessed with a son and daughter. He never forgot us and was frequently on the Mumbles scene, often enjoying a glass or two in the Vic. It was always a delight to talk with such an amicable and wise fellow. As regards Emrys Owen, although I saw him on a number of occasions in the Vic after the war, I sadly lost touch. I shall always remember him for his sheer niceness and that beautiful tenor voice which tugged at one’s heartstrings, especially when he sang, “Myfanwy”! So! 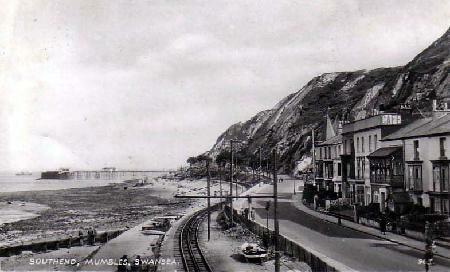 Things did happen in Mumbles in the twenties and thirties. Quite honestly, I think we were at the cutting edge - in everything!